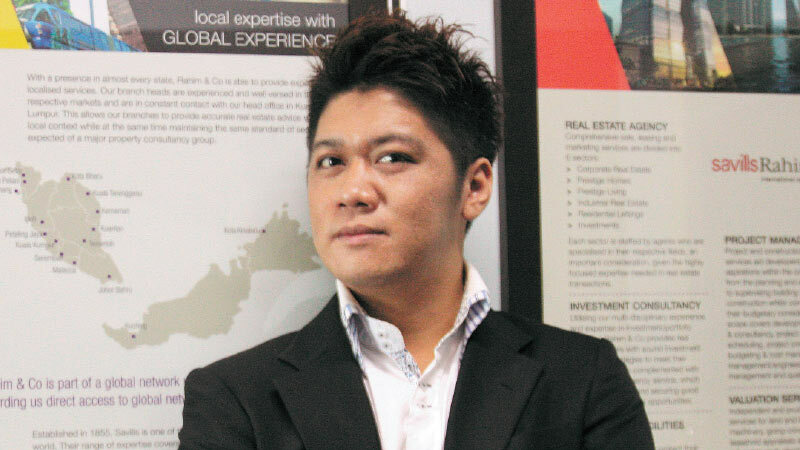 Despite the challenging market, prices of Kota Kinabalu residential properties are unlikely to drop as demand remains high, says Rahim & Co branch manager (Kota Kinabalu) Max Sylver Sintia. 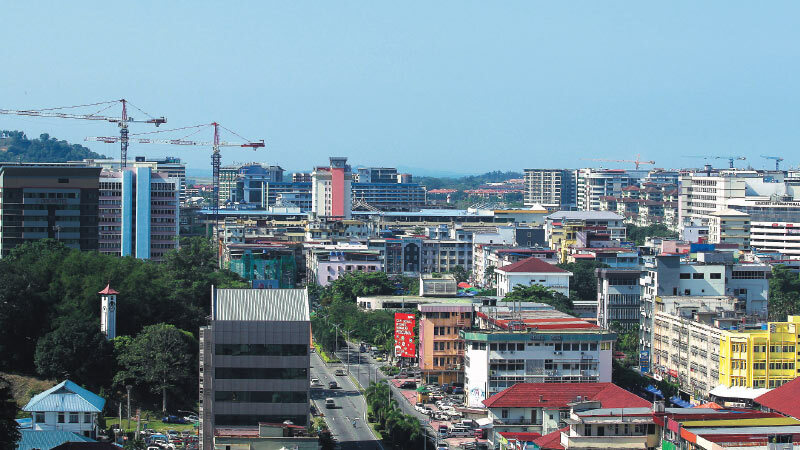 “The slowdown in the Kota Kinabalu residential property market has been mostly attributed to stringent lending conditions, making buyers struggle to secure financing. This is amid strong demand for residential properties, particularly from the younger generation in the secondary market,” says Max, in presenting The Edge/Rahim & Co Kota Kinabalu Housing Property Monitor 3Q2018. As we enter the last quarter, he anticipates a pickup in the Kota Kinabalu residential property market, particularly the older stratified residential properties in the secondary market that fall in the mid-range segment and are situated in mature residential areas. 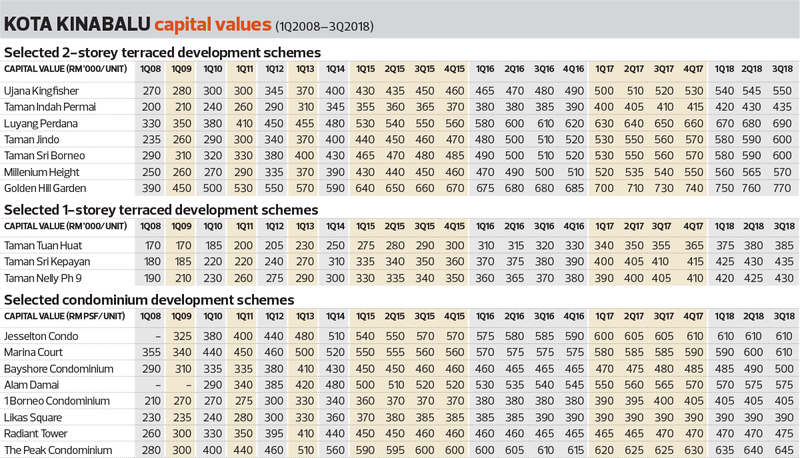 “Older stratified properties in the secondary market are more attractive with more affordable prices than landed properties in the primary and secondary markets, as well as stratified properties in the primary market,” Max says. During the quarter under review, the year on year price growth of the landed properties sampled ranged from 5.48% to 8.54% while condominiums saw y-o-y price growth of 0.8% to 4.3%. The third quarter saw an overall stable housing market with average rental yields from 3.7% to 4.69% for landed properties and 3.87% to 5.99% for condominiums sampled in the monitor. Two-storey terraced houses recorded average y-o-y price growth of 6.19%, or about RM35,000, in 3Q2018, compared with last quarter’s y-o-y growth of 8.05%. The best performers in terms of y-o-y growth in the third quarter were Taman Jindo and Taman Sri Borneo (both up 7.14% to RM600,000), followed by Luyang Perdana (+6.15% to RM690,000), Taman Indah Permai (+6.1% to RM435,000), Ujana Kingfisher (+5.77% to RM550,000), Millenium Height (+5.56% to RM570,000) and Golden Hill Garden (+5.48% to RM770,000). On a quarter on quarter basis, the average price growth of the 2-storey terraced houses sampled was 1.31% in 3Q2018, compared with 2Q, when prices saw q-o-q growth of 1.5%. The best q-o-q growth was recorded at Taman Jindo and Taman Sri Borneo (both up 1.69%). This was followed by Luyang Perdana (+1.47%), Golden Hill Garden (+1.32%), Taman Indah Permai (+1.16%), Ujana Kingfisher (+0.92%) and Millenium Height (+0.88%). As for 1-storey terraced houses, average y-o-y price growth during the quarter under review was 6.91%, or RM26,667, compared with 2Q y-o-y price growth of 7%. The highest y-o-y price growth in 3Q for 1-storey terraced houses was at Taman Tuan Huat (+8.45% to RM385,000). This was followed by Taman Nelly Phase 9 (+6.17% to RM430,000) and Taman Sri Kepayan (+6.1% to RM435,000). On a q-o-q basis, the 1-storey terraced houses sampled registered an average growth of 1.22%. The best performer in terms of q-o-q growth during the quarter was Taman Tuan Huat (1.32%), followed by Taman Nelly Phase 9 (+1.18%) and Taman Sri Kepayan (+1.16%). Prices of condominiums in 3Q2018 grew at an average 2.07% y-o-y to RM526 psf per unit from RM515. In the previous quarter, prices rose 1.9% y-o-y. 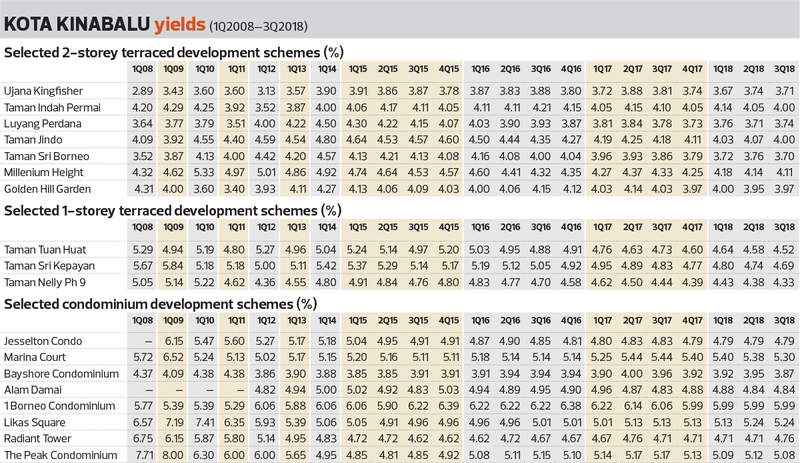 The highest 3Q y-o-y growth was seen at Marina Court, up 4.3% to RM610 psf from RM585. This was followed by Bayshore Condominium (+4.2% to RM500 psf), The Peak Condominium (+3.2% to RM645 psf), Alam Damai (+1.8% to RM575 psf), 1Borneo Condominium (+1.3% to RM405 psf), Radiant Tower (+1.1% to RM475 psf) and Jesselton Condo (+0.8% to RM610 psf). No y-o-y growth was recorded at Likas Square, which has maintained an average price of RM390 psf since 3Q2016. On a q-o-q basis, condo prices grew an average 0.69% during the quarter, compared with 0.54% in 2Q. The highest q-o-q growth was at Bayshore Condominium (+2%) followed by Marina Court (+1.7%), Radiant Tower (+1.1%) and The Peak Condominium (+0.8%). The rest of the condominiums sampled did not register any price change q-o-q during the period under review. Rents of 2-storey terraced houses grew at an average of 2.99% y-o-y in 3Q2018, up 0.64% from the previous quarter. The best y-o-y rental growth during the quarter was seen at Luyang Perdana, which climbed 4.88% to RM2,150 per unit per month. This was followed by Golden Hill Garden (+4.08% to RM2,550 per month), Taman Indah Permai (+3.57% to RM1,450), Ujana Kingfisher (+3.03% to RM1,700), Taman Sri Borneo (+2.78% to RM1,850) and Taman Jindo (+2.56% to RM2,000). There was no change in rental rate at Millenium Height, which has maintained an average rent of RM1,950 per month since 2Q2017. Rental growth for 1-storey terraced houses during the quarter averaged 3.31% y-o-y but there was no change on a q-o-q basis. On a y-o-y basis, the highest rental growth in 3Q2018 for the 1-storey terraced houses sampled was at Taman Tuan Huat at 3.57% or about RM50 per month to RM1,450 per unit per month. This was followed by Taman Nelly Phase 9 (+3.33% to RM1,550 per month) and Taman Sri Kepayan (+3.03 to RM1,700). Meanwhile, condo rents grew at an average of 1.37% y-o-y during the quarter, compared to the previous quarter’s with average growth of 1.11%. 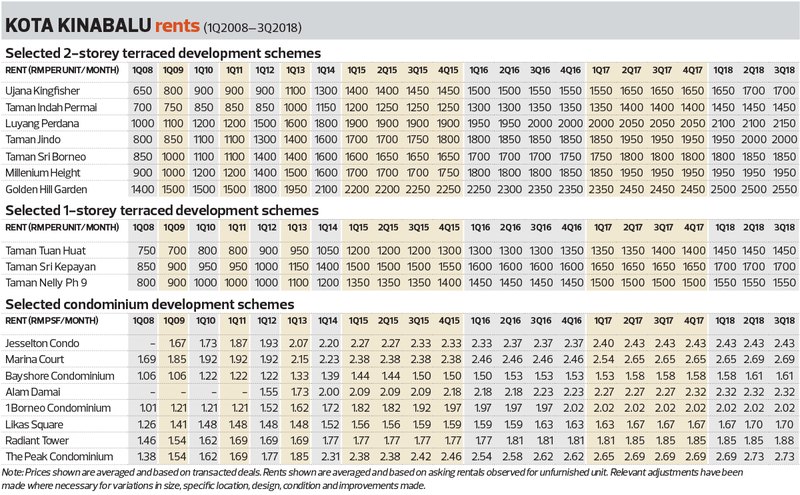 Likas Square enjoyed the best y-o-y rental growth during the quarter at 2.22% to RM1.70 psf per unit per month. This was followed by Radiant Tower (+2.08% to RM1.88 psf per month), Alam Damai (+2% to RM2.32 psf), Bayshore Condominium (+1.75% to RM1.61 psf), Marina Court (+1.45% to RM2.69 psf and The Peak Condominium (1.43% to RM2.73 psf. The rest of the condos sampled saw no change in rent on a y-o-y basis. On a q-o-q basis, the condominiums sampled did not register any growth in rent save for Radiant Tower at an average of 2.08%. The average gross yield for 2-storey and 1-storey terraced houses sampled during the quarter was 3.89% and 4.51%, respectively, down 0.16% and 1.44% from 3Q2017. The highest gross yield for 2-storey terraced houses was recorded at Millenium Height (+4.11%), followed by Taman Jindo and Taman Indah Permai (both +4%), Golden Hill Garden (+3.97%), Luyang Perdana (+3.74%), Ujana Kingfisher (+3.71%) and Taman Sri Borneo (+3.70%). As for 1-storey terraced houses, the highest gross yield during the quarter was at Taman Sri Kepayan (+4.69%), followed by Taman Tuan Huat (+4.52) and Taman Nelly Phase 9 (+4.33%). The average gross yield of the condominiums sampled in the third quarter was 4.98%, down 0.03% compared with 3Q2017. The highest gross yield of condos during that quarter was at 1Borneo Condominium (+5.99%), followed by Marina Court (+5.3%), Likas Square (+5.24%), The Peak Condominium (+5.08%), Alam Damai (+4.84%), Jesselton Condo (+4.79), Radiant Tower (+4.76%) and Bayshore Condominium (+3.87%). In terms of Sabah’s overall market performance, in 2Q2018, there was a y-o-y drop in transaction volume in the state of 12.89% to 1,081 units of residential properties, according to the National Property Information Centre’s (NAPIC) latest data, says Max. Compared with 1Q2018, the volume of transactions in 2Q dropped 19.39%, indicating an overall softer market. Compared with 2Q2016, the number of transactions was 29% higher, and compared with 2Q2015, it was 16.65% lower. Max says NAPIC data revealed that the overall number of residential properties transacted in 1H2018 was 5.4% higher compared with 2,298 units in 1H2017. In terms of value, transactions amounted to RM393.87 million in 2Q2018, 14.78% lower than in 2Q2017. Compared with 1Q2018, transaction value in 2Q was 22.98% lower than the RM511.37 million in 1Q. Compared with 2Q2016 and 2Q2015, transaction value in 2Q2018 was 43.09% higher and 2.83% lower respectively. Meanwhile, Max says most residential property transactions in Sabah during the second quarter, in terms of value and volume, were in Kota Kinabalu and Penampang. Of the total residential property transaction volume in Sabah during the second quarter, 601 units or 55.6% were in Kota Kinabalu and Penampang, which saw a combined transaction value of RM264.4 million, making up 67.13% of the total value in the state. He says that compared with 1Q2018, 2Q saw a decrease in transaction volume and value in Kota Kinabalu and Penampang by 20.40% and 29.63%, respectively. In terms of price range, 605 units, or 55.97% of the total residential property transactions in Sabah in 2Q2018, were priced below RM300,000; 273 units or 25.25% were priced at RM300,001 to RM500,000; 167 units or 15.45% were RM500,001 to RM1 million; and 36 units or 3.33% were above RM1 million, Max says.